Can’t link you to our G + page as we keep it private, but that’s where 25 SFF writers post our best of the best blog links. But yeah, it’s going to my page as well. Kristen, have lost count how many times I’ve posted you. I love, love, love this post and will be flogging the snot out of it to the group. Thank you! This blog post is so full of good, juicy stuff, I had to share! Read carefully, and do consider employing deep PoV in your next book. LOL I can’t count how many times I’ve put this in comments while editing. “Begin to” must also be added to that. When I first heard the term Deep Third or Deep POV I though exactly that–what the . Deep POV is nothing more than third person limited omniscient, and it’s been around for a long time. But, I am an academic and like the technical terms, and you are so right Kristen. POV preference does indeed change with the times; I love your historical take on the topic. And you know, microbrews changed a lot of our history too– “Thank the gods for out of work monks,” he said breathlessly as he gulped from his home basement made meade and felt his wrist brush across his lips to wipe away the excess. Thanks, Kristen, your explanation is clear and concise! Very helpful. Good medicine for clean writing! Thanks Kristen! Where is the tip jar? This is worth a fiver! I struggle with deep pov when writing in third person, but in first person pov, my main character takes her place on center stage as the only star. It also means a lot less editing… like a year’s worth of difference. Knowing this, it’s better to stick to my strength. So simple…and yet so difficult not to slip back into the lazy storyTELLing mode. Thanks for this post. Deep POV is exactly what pulls me into a book. I can hardly read omniscient anymore (and wouldn’t even think of writing it, sorry John Flanagan). I picked up Rise of the Machines a couple of months ago and have been putting the advice into practice. Great book, not only for the tips, but for the really great, fun writing! Thanks. Question: Did Tom come to kill her because she stole his poodle’s name? Seriously, Kristen, thank you for making this so clearcut. It amazes me how many books I read — including those from the Big 5 — where the POV becomes redundant because the editors let this stuff slide. I’m a fan of deep POV too and always write that way. Sharing on Twitter right now! You’re awesome! I’ve improved on my use of deep POV from story to story, using actions and movements of characters instead of dialog tags, or writing a character’s thoughts without the use of he or she thought/pondered/wondered, but I occasionally throw in a tag absent-mindedly. I think the “old habits” are more evident in my first novel than they are in my second (still there, but not as many) and my more recent short stories and novellas. I’m quite cognizant of it now, working through the first draft of a new novel. Also, in a scene with only two characters, I might start their dialogue with a tag or two, but then let it roll for several lines without tags to enhance the intensity and speed of their exchange. To your point, Kristen, readers are intelligent and will know who is talking, but I’ve still had editors ask me to add more tags to avoid possible confusion. Thanks for the lesson in Deep POV. 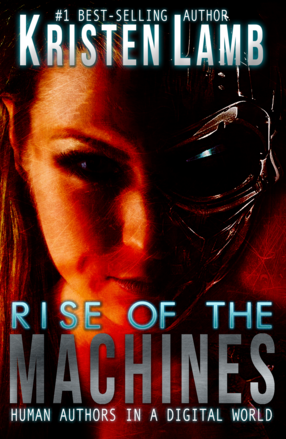 Just finished reading Rise of the Machines again. The lessons learned there also resulted in book sales which is what being an author is all about, right? I thought I had already done it, but I went and looked and realized I had not written a review! The Shame! It’d done now! Five Stars too! Reblogged; yet another great piece of advice. Thank you very much for the helpful tips. Kristin Lamb’s SUPER POWER is the ability to take writing advice I’ve heard a thousand times (and *yawned* at) and make it SPARKLE. I suddenly GET “deep POV”. Kristen, I just re-blogged this post. I don’t know HOW you do it, and I’m not really sure WHY you do it, but this post on deep POV blew me away. My critique partners at Seton Hill (their Writing Popular Fiction MFA program is awesome, by the way) have been circling, highlighting and crossing-out all my “tags” and I did understand what they meant, but you just said it so perfectly that I finally, FINALLY “got” it. Thanks, Kristen! I tend to be on the dense side, myself so I learned I had to make it stupid simple so people like ME could “get” it 😀 . Your wicked sense of humor really is the key. For me, at least. Thanks again. Awesome post by Kristen Lamb on writing Deep Point of View. Writing Deep POV allows the reader to feel and experience what the character does and its not hard to do. Also, Kristen’s class, ‘Your Story in a Sentence’, was super helpful and I recommend it to anyone thinking of pitching their manuscript at a writing conference or a query letter to an agent. Whew! I’d heard “deep POV” but never looked up what it means. I’m so glad to hear you say people *like* it, because apparently I’ve been accidentally using it in my first novel this whole time. Although now that I know what it is (thank you!!! ), I’ll keep a close eye during revisions to make sure I haven’t slipped up here and there. Dear Kristin, I’m enjoying your blogs. I’m particularly grateful for today’s education. This is most helpful! Thank you for this article. I’ve never heard of deep POV. And I had never thought of the word ‘said’ representing author intrusion. In fact I tend to omit the word in my own writing, making it clear from the dialogue who is speaking. My writing is concise and I didn’t think I used author intrusion ( but always notice it when judging short stories) so will have to keep myself on track now to avoid it! Ooo! I love this post! I’ve been doing this on my novel and everytime I go through it I see more words that I can strip from it. This explanation is going to help me out a ton when I have to explain to my client that “he said” isn’t necessary after every single line of dialogue. Intrusion is the perfect word. Very helpful. Thank you! This is solid advice on how to write in deep POV. I just feel compelled to point out James Patterson’s tag line for his writing course. Focus on the story, not the sentence. Since I live within 30 miles of where I was born and will most likely die here (not soon I hope) I welcome any writing ideas I can find! This was very clear and your sense of humor helps the read! What a transformation from the 1st example to the very last. I probably have A LOT of revising to do so thank you for the catalyst. Wow the correct way to handle POV now has a name, go figure. If one only uses tags and the like for clarity, they are used less. Never waste or overuse any word. I keep waiting for you to announce a Deep POV class. I get it intellectually, but getting it down in writing is easier said than done. Kristen gives more good tips than a flirtatious businessman gives a pretty waitress who mistakes her smile as an open invite. I really do appreciate you helping me understand a Deep POV better, makes it easier to trim the fat and get to the meat of the matter at hand during my story. Keep of the great work Ms. Lamb, because you rock, POV and all! Hahaa! I like your publishing website too. I am currently writing crime fiction and hoping to publish later this year so will definitely require your services. CLear and concise. Thank you very much. I’ve asked several writers (by way of internet) about deep pov to no avail. Sure, they thought they were explaining it to me but… Kristen, giving the example and working it through made all the difference in the world for me. Turns out I’ve been doing this in my draft anyway, although now I wonder if I should be doing it all the time and not just when I want to quicken the pace a bit. LOVE your blog and your writing. Can’t enter the Patterson contest, but your Fifi sounds terrific – best of luck in becoming his next co-author!!! Keep these lessons coming. I can actually grasp it when you spoon feed it to me in small bites. I’ve been reading about deep POV but today you smacked me upside the head with it. I appreciate it. Thank you! This is a very helpful example. I’d love to see more deep PoV examples, and perhaps someday get some hands-on one-on-one instruction and feedback. On another note, I know what you mean about unnecessary words but I find the comment contradictory when it comes to the blog posts. The information you provide in your posts are very helpful. I can tell you’re a great resource when it comes to writing techniques. Despite the helpful information, I don’t visit your blog very much because I find the long posts daunting. When I do read, I tend to skim over most of it before I get to the good stuff. Perhaps most readers find all the detail helpful? I’ve done it both ways. The problem with a blog is that really going through to edit and make them short takes time. I do this for free, so I really need to do the paid work. I have gone shorter and had complaints. People like the long posts because, while long for a blog, I give you information that might be in 50 pages of a craft book. I also deliberately bullet these posts for folks like you who are skimmers. If you need extra elucidation? It’s there. If not? Skim and you’re still good. Such is the challenger for writing to a variety of tastes 😀 . Now my BOOKS? Those are lean. But I spend a lot more time in editing those. Thanks 🙂 I still find your posts very helpful. I can understand that you can’t please everyone, so it makes sense to do what’s easier for you. Thank you for highlighting and using bullet points for those of us who tend to skim. I generally try to write like this (though I didn’t realize there was a name for it), but my elementary and middle school teachers keep bopping me upside the head – in my head, of course. Thanks for writing this! Exactly what I am looking for to help shorten my manuscripts. Also, some of the best beer in Germany IS made by monks. Had some when I was there.. yummm..
Kristen Lamb has one of the most respected, award-winning writers blogs in the blogosphere. On occasion, I like to seek over to her blog and do a “Reblog” from one of her great posts. This particular blog is about Point of View (POV) which can be more difficult to keep consistent, or intriguing, when writing fiction or non-fiction then most writers know. I hope you enjoy her post, and I encourage you to follow her blog. Wonderfully helpful post, just found out that I’m a bit cleverer than I thought! Very good post but HOW’D IT TURN OUT FOR FIFI? I recognise it now. It is more intimate, I must try more and stop getting so confused. lol Thank you for a great post, going to look forward to the next one. Kristen Lamb is introducing deep POV. There’s so much to learn and so little time. Thank you Kristen for another very educational blog post! thanks for this, the history helped me to understand the deep POV. Will reblog. Soon there won’t be any words left to use. We’ll have nouns and verbs. Deep POV is not necessarily something you use for the ENTIRE story. We use it as a tool to zoom in the perspective and give added intimacy. In fact, using it this way is actually quite effective. It’s the literary equivalent of what filmmakers do with music. No, I will not consider deep pov. Editorial omniscient narration is my one true way, and I will not be deterred from it by any kind of opportunism.